An inn since 1506, The Dolphin had been first built over one hundred years before in 1390 - early records from 1492 suggest it as being a tenement on land called “Le Dolphyn”. It is in the 16th century, however, that the first suggestion of royal patronage occurs with a reputed visit by Henry VIII. During the 1800‘s, though, the hotel had come to play host to many of the time’s notable figures. 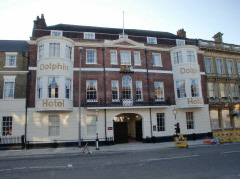 On The 13th January 1801 - days after being promoted to “Vice Admiral of The Blue“ - Lord Nelson stayed at The Dolphin where, years later, a letter from his wife Josephine was discovered. It is known that King George III had his own private suite, and it is also believed that William IV stayed on at least one occasion. Indeed, from 1898, Queen Victoria regularly used the hotel while awaiting carriage to The Isle of Wight. Strong literary connections also to be found: William Makepeace Thackeray wrote Pendennis during his time as a guest, and during the winter assembly of 1808, a young Jane Austen danced at a ball on her eighteenth birthday.